place for sites on which UpdraftPlus is installed. sites on which UpdraftPlus is installed from one central location in the Cloud. 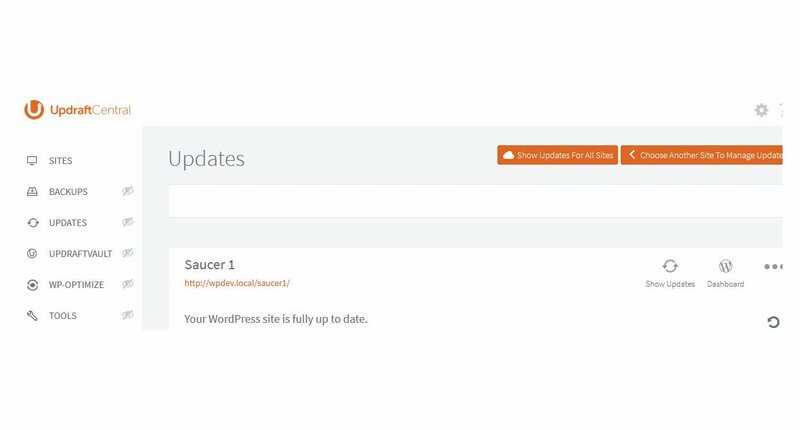 You can even centrally manage and update all themes, plugins and the core on all your sites without logging into them! Crammed full of features such as automated backup schedules and sophisticated one-click updates, UpdraftCentral is sure to boost to your productivity. What can UpdraftCentral Cloud do? Load UpdraftCentral with one strong password, and get access to the dashboard on all sites that have UpdraftPlus with one click. Allows you to perform full updates on themes, plugins and cores, and manage the settings from one central dashboard. 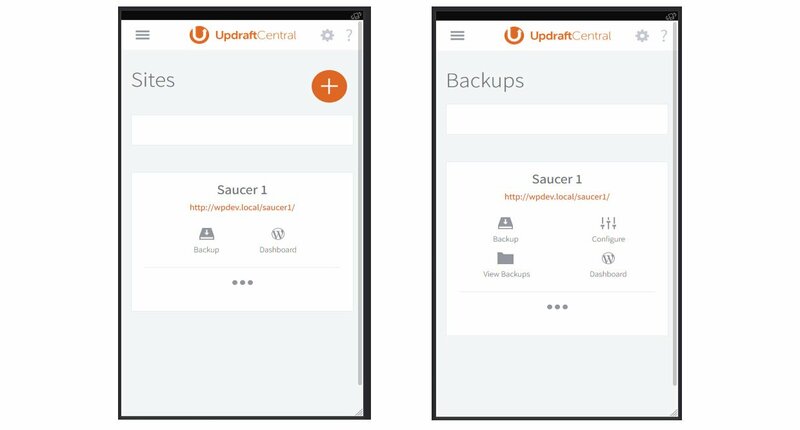 With UpdraftPlus installed on your sites, you can backup all your sites directly using the UpdraftCentral dashboard. Easy access to the backed-up files of all your remotely-managed websites through your UpdraftVault account. UpdraftVault is our remote storage solution, fully integrated with all our plugin. Easily inspect current systems information and manage site configurations and settings, to troubleshoot problems straight away. View, create or delete users and grant them different levels of access on any of your websites from one place. Allows more remote control over your websites by letting you install and activate any plugin or theme onto all connected websites at once. An incredibly useful feature that gives users an instant overview of important KPIs from all of their remote WordPress websites in one central location. Manage comments for remotely controlled WordPress websites, without leaving the UpdraftCentral dashboard. 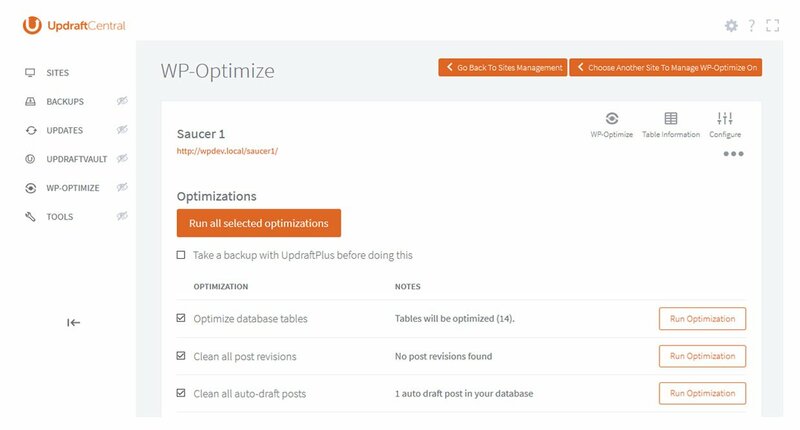 Control the WP-Optimize plugin and all your sites from UpdraftCentral in order to make streamlining all of your website databases even easier and more effortless! An invaluable tool for keeping on top of multiple websites, creating bespoke categories that make it quick and easy to locate a particular kind of content. RSA encrypts and signs all communications between sites, unique key-pairs every connection, and can even be run by localhost. Sends all communications directly from the browser for maximum speed and efficiency. Plus it’s all in the front-end to avoid annoying refreshes. Offers support via a professional, fast, ticketed support service and active forum. Click here for full comparison of all the different UpdraftCentral packages. to manage all your WordPress websites from one place? We’ve put together a list of why UpdraftCentral is the right service for you! 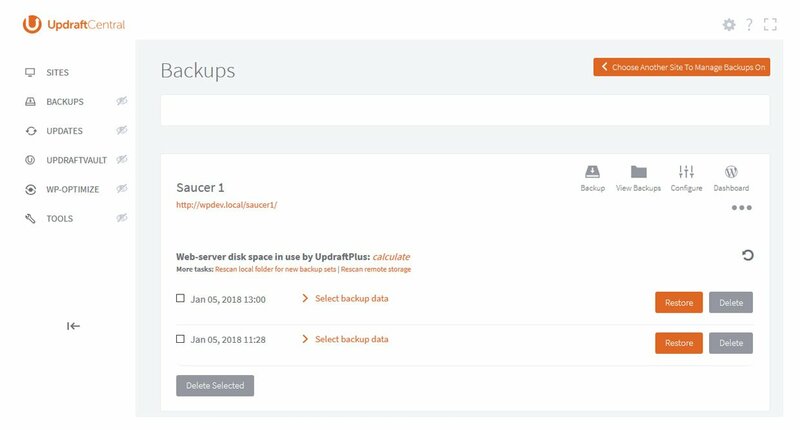 See how UpdraftCentral enables you to manage all of your UpdraftPlus backups at once, remotely and via a single dashboard. 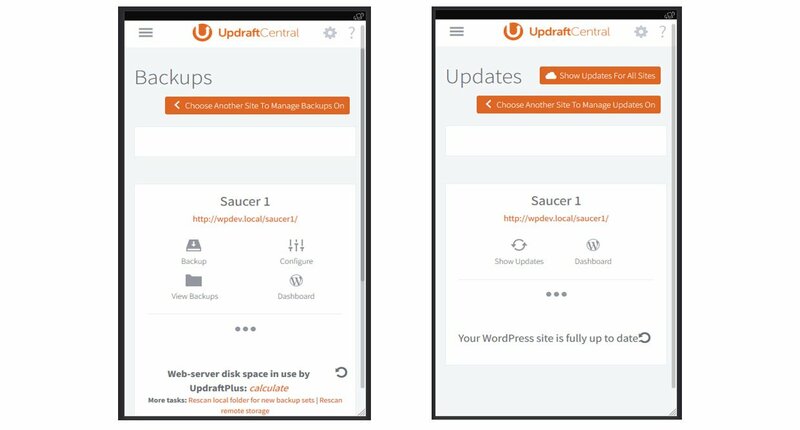 How does UpdraftCentral compare with other services to manage all your WordPress websites from one place? UpdraftCentral is a powerful and flexible admin panel that allows you to access all your websites with a single click and efficiently manage them from a single dashboard. • WordPress 3.2 (July 2011) or later. There are no further version PHP/MySQL requirements. • No active security modules (whether a WordPress plugin, or webserver component) that block traffic based on unusual patterns. Encrypted traffic from a remote control plugin is likely to be blocked, as it looks very different to regular website visits from a web browser. We have tested with the most popular WordPress plugins, and these are all not a problem in all the configurations we have tested. Please Click here for full comparison of free, Premium and Cloud versions. Nb. 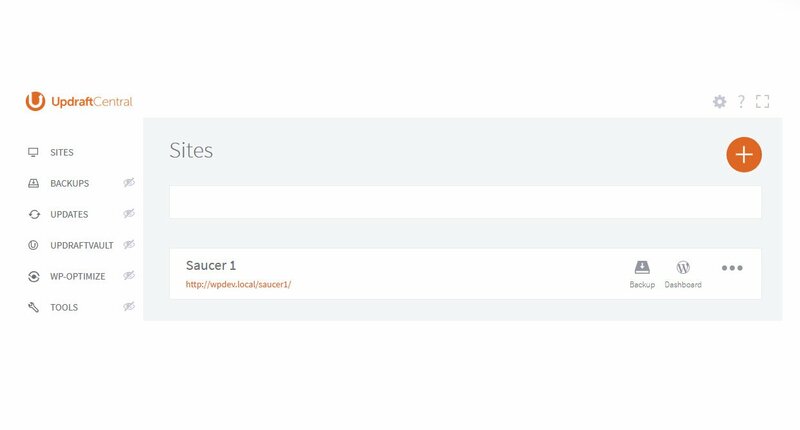 This plugin is the central dashboard plugin: install it on the “mothership” site where you want your dashboard, and it will control other UpdraftPlus-installed websites. UpdraftCentral install is different to free and Cloud version as it is a self-install option. If you want to run and self-install UpdraftCentral as a plugin, rather than as SaaS, this video shows you how. The below video will also show you how to add a new site. If you choose to self-install you will have to self-host UpdraftCentral. But with UpdraftCentral Cloud you have all the benefits and features of UpdraftCentral, but we do all the hosting and maintenance of the app for you. Please Click here for full comparison of free, Premium and Cloud version.